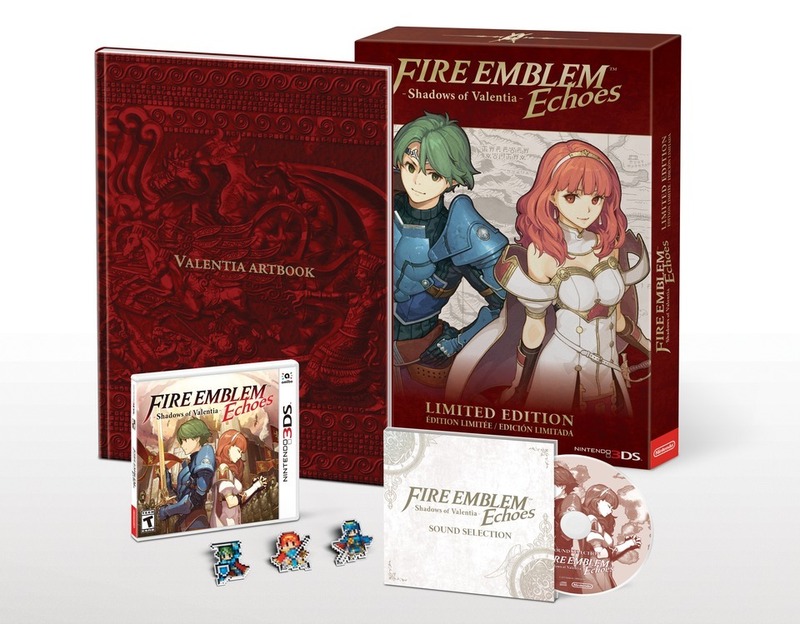 REDMOND, Wash.–(BUSINESS WIRE)– Fans that want to level up their Fire Emblem Echoes: Shadows of Valentia experience when the game launches exclusively for the Nintendo 3DS family of systems on May 19 can do so by picking up the game’s Limited Edition bundle, launching the same day. The Fire Emblem Echoes: Shadows of Valentia Limited Edition bundle includes the game; a hardcover Valentia Artbook; a Fire Emblem Echoes: Shadows of Valentia Sound Selection CD; a Fire Emblem Echoes: Shadows of Valentia Pin Set depicting characters Alm, Celica and Marth; and a reversible cover sheet that looks like the packaging for the original Famicom game this new one is based on. It will be available at a suggested retail price of $59.99 at select retailers. Fire Emblem Echoes: Shadows of Valentia reimagines Fire Emblem Gaiden, a Famicom game that was previously only released in Japan. This new version of the game sports modern graphics, cinematics and, in a first for the series, free-roaming 3D dungeon environments. Also launching on May 19 are the Alm and Celica amiibo figures, available only as a set at a suggested retail price of $24.99. When used in the game, these amiibo will activate their own exclusive dungeons, allowing heroes to earn items and level up their armies further by defeating bosses. By selecting Mila’s Turnwheel from the menu on the overworld map, they will also be able to take advantage of their Alm and Celica amiibo in battle. During combat, players can sacrifice a portion of Alm or Celica’s health in order to summon a computer-controlled illusory hero, which will act as a temporary ally for a single turn. As Alm and Celica get stronger, their stats can be saved to their respective amiibo, allowing their summoned unit to grow in strength alongside them. In addition, all Fire Emblem amiibo from the Super Smash Bros. series can be used to summon an illusory hero of that character, allowing players to seek assistance from spectral visages of Marth, Ike, Roy, Robin, Lucina and the upcoming Corrin amiibo. All other currently available amiibo are also compatible, and will summon an additional monster to the battleground to assist players in battle, providing some much-needed help in case of a strategic emergency. This game is the latest in the long-running and growing strategy-RPG series, and comes hot on the heels of the recently released free-to-start game Fire Emblem Heroes on smart devices. Fire Emblem Echoes: Shadows of Valentia will see players take control of the two separate armies of Alm and Celica as their differing quests attempt to achieve the unified goal of bringing peace to the land of Valentia. Battles in the Fire Emblem series see players take their small force of recruited soldiers against increasingly powerful armies in turn-based battles that require careful tactical planning, as mistakes or failed attacks will see units become exposed and vulnerable to enemy attack. The Fire Emblem Echoes: Shadows of Valentia Limited Edition bundle launches in stores on May 19 at a suggested retail price of $59.99. The stand-alone version of the game will also be available at a suggested retail price of $39.99. For more information about the game, visit http://fireemblemechoes.nintendo.com/.